After the disappointing “The Wake-Up Bomb,” “UBerlin” is a rather pleasant return to form for Covert Affairs. It’s pretty much exactly what I expect and consequently want from the show: a totally contrived and in parts poorly-developed but also often entertaining and sometimes arresting bit of junk food TV. The events of “UBerlin” require Annie to play sidekick to Arthur Campbell. Together, Arthur and Annie run around Berlin trying to make a deal with Elsa, a former Stasi agent that asks to be smuggled out of Germany in exchange for information. This forces Joan to take Arthur’s place and in general gives episode writer Erica Shelton an excuse to make Annie’s tender relationship issues with her sister Danielle just one of several sub-plots in this week’s superior episode. First, episode director Jonathan Glassner deserves credit where credit is due for giving Berlin a distinct and very believable character without ever really overplaying his hand. The frequent shots of the yellow elevated train, the ubiquitous graffiti, and the outdoor curry wurst stands: This is definitely a tourist’s view of Berlin. And that’s a good thing, for the most part. Glassner doesn’t conspicuously show us the city as he thinks it looks according to a bright-eyed new-comer like Annie or even how the city looks to someone like Arthur, an American agent that worked in Berlin during the ‘80s. There’s no heavy (ie: clumsy) post-Cold War commentary, nor is there any ditzy commentary about German pilsner or the quality of curry wurst. All of this stuff is just there in the episode’s background. I’m especially thankful that there wasn’t a music cue from any of David Bowie’s Berlin-produced albums after Arthur quotes Bowie early on in “UBerlin.” That allusion is cheesy enough. After the Bowie quote was made, I was relieved to see that the Thin White Duke never came up again. Then again, Shelton’s script only selectively follows-through on certain ideas or themes, so maybe what I’m applauding as Glassner’s light touch is actually a product of Shelton’s poor plotting. But first, let me give Shelton her due for introducing some commendably intelligent plot developments. Joan asks Annie to keep an eye on Arthur while he’s in Berlin. This makes sense for a couple of reasons. Firstly, Elsa and Arthur worked together during Arthur’s time in Berlin in the ‘80s, which is why she asked for his help in catching Isaac, a money launderer. It also makes sense given that Joan is shown to be irrationally paranoid and protective when it comes to Arthur and other women. This has been a part of her character since the pilot. So that works out well enough. This wouldn’t be that remarkable if Shelton didn’t develop Joan’s character arc in an appreciably thoughtful way. While the episode’s main spy story arc was perfectly adequate, I was quite pleased to see Joan treated like something other than a smart shrew that exists to reprimand Annie. With Arthur out in the field, Joan has to step in and take his place. Two people try to meet with Arthur, and neither one is especially thrilled at the prospect of having to work with her instead of Arthur. The first is a co-worker that comes back multiple times for reasons that are ultimately only explained later (Spoiler: Fantasy football! I laughed). And the other is Jai, who has always had a quasi-antagonism with Joan going. What I like most about Joan and Jai’s brief but notable meeting is that it unobtrusively affects the spy plot du jour. At one point, Arthur needs $3 million to trick Isaac into thinking he’s defecting from the U.S. and wants to launder some money. Annie tells Joan this, and she understandably balks, saying that the C.I.A. doesn’t have that kind of money. Arthur apparently anticipated that response and tells Annie to remind Joan of a mission in Santorini. This is the same mission that Jai just name-dropped when he came by Arthur’s office and found Joan sitting at Arthur’s desk. The Santorini funds are apparently unavailable, according to Jai, a plot point that only makes sense during the mission. I like that that interaction actually means something and is set up in one scene only to pay off in a later one. Clever, clever. And yet in spite of how appreciably nuanced some aspects of “UBerlin” are, the follow-through for other parts is predictably lame. 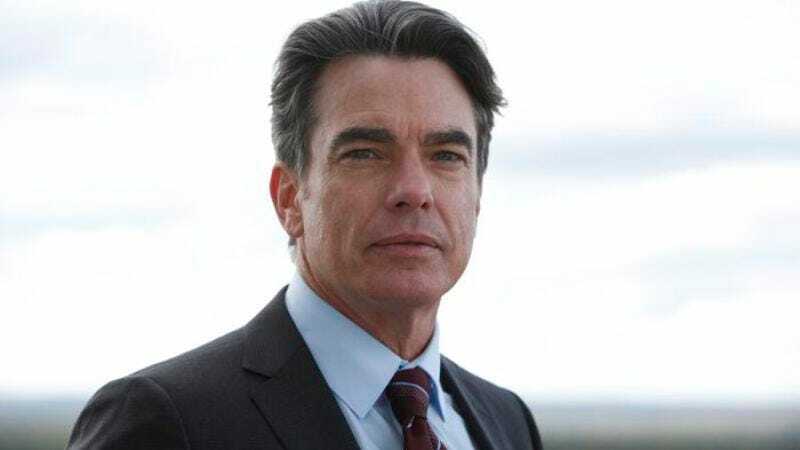 Peter Gallagher is plenty good, but the dialogue he’s stuck with is mostly unremarkable. Worse still, the car chase scene that serves as the episode’s big set piece is pretty drab and frustratingly over-edited to death. Hearing two black sedans rev their engines every couple of seconds and watching unfocused, split-second close-ups of Gallagher at the wheel of one those black sedans (though which one is often hard to tell) is really pretty irritating. I’m also a little irritated, though not really frustrated, by the way that Danielle and Annie’s problems, like Joan’s request for Annie to follow Arthur or the subplot where we discover that both Annie and Arthur have been followed throughout most of the episode, aren’t developed in anything but contrived ways. They all stop and start conveniently and wrap up whenever Shelton had time to fit them in. This is presumably the price one pays for a somewhat ambitious episode, one where multiple characters are given equal face time. That’s a trade-off I can live with, though Augie’s story arc was especially weak. Seeing him go out with Parker, the sister of a recently deceased agent (EDIT: This was changed thanks to comments from, uh, commenters), at a sports bar and then later follow-up with her seemed like a pretty perfunctory use of Chris Gorham’s character. That time would have been better spent developing Joan, Annie, or Arthur’s respective stories. Still, within the realm of expectations I have for Covert Affairs, tonight’s episode was a pretty decent one.